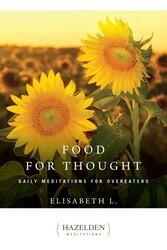 Food for Thought offers comforting words for compulsive overeaters who seek to understand the role of food in their lives, and helps them support a life of physical, emotional, and spiritual balance. Food for Thought offers wise and comforting words for compulsive overeaters who seek to understand the role of food in their lives. Each day’s reading in the best-selling classic–the first Hazelden meditation book to address the needs of overeaters–supports a life of physical, emotional, and spiritual balance.Read daily by millions, Hazelden meditation books have set the standard for quality and popularity. Like all the Hazelden meditation favorites, Food for Thought provides enduring wisdom, reassurance, and strength.